OK, so working at home has brought me to the realization that my existing seating arrangement has got to go! The big desk has a big, comfy, “executive” style chair – which is great… but no so great for long term work at the computer (something I seem to be doing more and more of these days). The little desk (where I do most of my word) has an attractive, simple, straight backed chair (think “dining room chair”) which is great for sitting down to jot that thank you note to Aunt Tully, or zip off a birthday card to Uncle Knick Nack but not so great when spending several hours at a time in the seated position. Thus the search begins for a decent office chair. I’m well aware of the importance of a good chair. Having done a lot of data entry to earn some extra cash, I actually used to sit on one of those giant exercise balls. 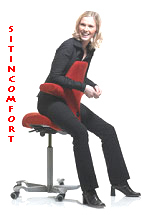 It was perfect – the right height, cushy enough to be comfy, and allowed me to move a bit, while keeping my body in good alignment. “Alternative” seating is nothing new to me. But even so, I was surprised at some of the things I found when looking for an office chair. OK, so those kneeling chairs have been around for a bit, and aren’t that surprising. Ummm… sorry, but… there have got to be more graceful looking ways of preserving your back. I can’t imagine sitting like that at home, much less in an office, in front of other people. I haven’t quite decided yet if it’s just that the sitting position looks so clunky, or whether it’s my dirty minded tendencies that can hear all sorts of potential innuendo. Either way, just… well… yeah… No! Clown hats weren’t quite what I had in mind… but yeah, that works. You are a hoot! I love your take on all the different options. You are not the only one that *sees* some other uses for some of these chairs. I have read several of your posts and really enjoyed them. I’ve added you to my favorites for future laughs.